This is an industry forced perception upon unsuspecting car owners that black is the most difficult colour to restore or fix when in fact it is very much the opposite. Check out our video to learn more on a black Mustang that was restored with Paint Correction to a diamond finish and how we explain on why Black is the easiest colour to restore. Here we explain why black cars are the easiest cars to restore with paint correction. How Do You Maintain Black Car Paint ? The easiest way to maintain black car paint to wash the car just as regularly as any other coloured car paint and always keep it away from car washes, including hand car washes, jet washes, touchless car washes. These car washes use very cheap and costic car polishing and car waxing systems that over time erode your paint. There is no difference on what level of detailing maintenance a black car gets. It is still two pack paint and will be subject to fade and wear and tear just as much as any other colour out there. The only difference is black shows damage more and therefore requires a little more care and some knowledge on polishing car paint or waxing car paint when it is due for maintenance. A Professional car detailer who knows a lot about black car paint correction can pull off miracles with black duco. There are of course required steps to be taken when preparing a black car for pasint correction and a high quality and industry experienced detailer will know how to do this. DO NOT ATTEMPT TO P0LISH YOUR OWN CAR IF YOU ARE NOT FAMILIAR WITH USING BUFFING MACHINES. How Do You Keep a Black Car Clean ? The easiest way to keep a black car as clean as possible is to keep as much dust off it as possible. This also applies to any other colour as well but primarily with black, it can be of an issue because it just shows so much more. The best way to keep black as clean as possible is to keep a dust cover over it when parked. Only problem is when you drive, your car still get dust on its paint and when you drag a car cover over black car paint, you can inadvertently scratch the surface. This over time will reduce the gloss level of your paint. The only way to really keep black car paint clean, is to wash it every time you drive it, and then cover it with a dust cover after drying and parking it. What Is The Best Car Polish For Black Cars ? The best car polish for black cars can be anything you want it to be. It doesn’t make any difference that because it is black, that it requires a specific type of polish. The only problem with black is that if you make a mistake polishing, it will show you and tell you that you made a mistake. Only problem after that is that you need to know how to correct that mistake. If in doubt, and you are not sure of what you are doing, my best advice is to leave it in the hands of a trained and experienced detailing professional and don’t mess with it. This very much applies to all colours when polishing car paint. It still shows if you made a bad choice but, it just shows more on black. 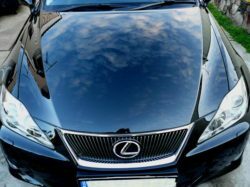 The best car paint protection for a black car very much depends on the use of your car, and what type of gloss you like on your car. If you prefer a rich depth wet look type of finish, a natural carnauba wax would do wonders to your car. This type of wax is great, especially when applied by machine, gives a natural beautiful look but also needs to be applied every three months or so if the car is driven regularly. If on the other hand you do not like applying a natural car wax, you can always go a synthetic car paint sealer which can last anything up to twelve months. 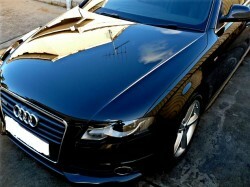 Your last option is to go the no polish or waxing required route which is man made car paint protection applications. These paint protection applications are harder wearing and tend to last longer than your conventional paint sealers and waxes. The added benefit from these is that no polishing or waxing is required after this particular type of paint protection application. The best advice that I can give is that you keep your car away from car washes of all types. 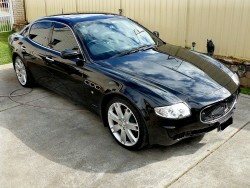 7 out of 10 car we restore at Dr Buff are car wash damaged and 7 out of 10 are all black. Car washes do an oincredible level of damage, especially over time and in some cases, thes cars also cam not be restored. 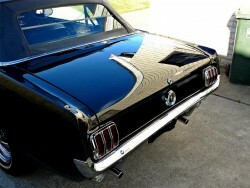 We hope you’ve enjoyed this page, and of you haven’t watch the video please watch it now as the information on it will explain on why black is the easiest car paint to restore.